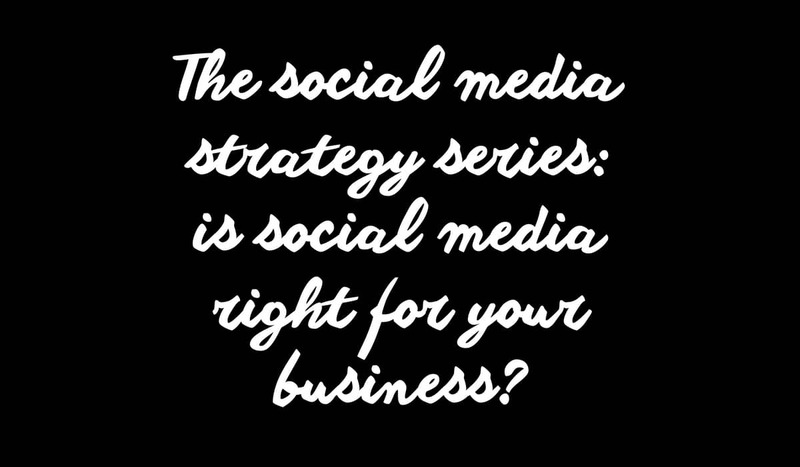 The social media strategy series: Is social media right for your business? [tweetmeme]This is the first in my social media strategy series where I give a step by step guide to developing a social media strategy. This week, I’m looking at whether it’s right for your business. Social media has been big news for a while now. You can’t read a trade mag, newspaper, business blog or pretty much anything else connected with business without tripping over some evangelical social media bod ushering you onto the social media train (and I do realise I’m one of them). Yes social media is one of the most effective communications tools we’ve had at our disposal for a long time. Yes it’s a huge shift in how we engage with people. And yes, it can deliver great results. However, it’s not necessarily right for every business. There are a number of considerations to think about before you jump aboard. Here’s a checklist that will help you to understand a little more about what’s involved and whether it’s right for you. Is social media appropriate for your line of business? Are your customers, clients and the people you want to connect with using social media? Are your competitors active in this space? Have you searched to see if people are already having conversations about your business, your industry niche or even your brand? If the answer is yes, then it could be a very useful tool for you. There are some great free tools you can use to find what conversations are happening now. Social Mention is a tool that searches for brand names or keywords mentioned across the web. Twitter search is a nifty little tool that offers a variety of ways to search for brand names or keywords on Twitter. Google Blog Search does as the name suggests, let’s you search across the blogosphere. And of course, don’t forget good old Google Alerts, which allows you to set up alerts that are emailed to you when a keyword is mentioned. Do you have buy in from the boss? So you’re clear social media can help your business. Does the board/the C suite/the boss feel the same? If not you could be heading for an uphill battle. Social media can take a lot of time and resources, resources that can quickly be taken away if the boss doesn’t see the true value. Make life easier for yourself by building a business case that will get full, ongoing support from the start. I’ll go into more detail on this in my post next week. Do you have someone that can dedicate ongoing time to social media? Are you able to restructure a member of staff’s job description to allow for it? Can you commit to this time and not take this person away from their social media activities when it gets busy? Remember, you can’t open the door to social media and close it when workloads increase. If the answer is yes to these, then you do. Social media really is a marathon not a sprint, so don’t expect results overnight. Are you prepared to invest the time with little output at the beginning? Are you prepared to put in the groundwork even when you won’t see the return on your investment straight away? Do you have the patience for it? If so, you’ll reap the rewards in the long run. Do you have a quality, fully optimised website you can direct people to from your social media profiles or blog? Is your website full of business speak that doesn’t engage your audience? Do you have other marketing or pr priorities to deal with first? Make sure your house is in order so that it will be easier to integrate social media with your other activities. Do you know what your objectives are? Do you know, and understand, what you want to achieve with social media? Are you clear what it can achieve and what it can’t? Have you tied this into your business plan? You need to be certain of your goals before you start, otherwise you’ll waste a lot of time and effort on something that isn’t targeted to your specific needs. If you’ve read through this checklist and still think social media is right for you, then great. You’re ready for the next stage: Getting Buy In. Once the series is done, we’ll be putting it all together into a handy ebook for you to keep. Well we’re nice like that. If you’d like to receive a copy of this hot off the press (well hot off the internet) sign up here. Grest content Gemma – very, very useful. Will forward this to the network! Great, practical advice there. So many people don’t even stop to think if they should do it, they just try it, often with horrific results. Exactly Craig, needs a bit of forethought. Awesome set up for a business Gemma, I love that you have put it out there that actually, social media may NOT be right for your business. Important stuff to consider first. Yeah exactly. Im getting a little tired of the ‘you HAVE to get on social media’ brigade. Yes it’s great, but there’s a lot to consider first. It is really to the point! Thanks John. The timing issue is a key one, so many people underestimate the time investment involved in making social media work, which usually results in the assumption that it doesn’t.